Solution for the oral treatment of pregnancy toxaemia in sheep and acetonaemia in cattle. Propylene glycol is an effective antiketogenic agent; cobalt chloride promotes the synthesis and utilisation of volatile fatty acids; choline chloride is a lipotrophic agent which assists in fatty acid metabolism. 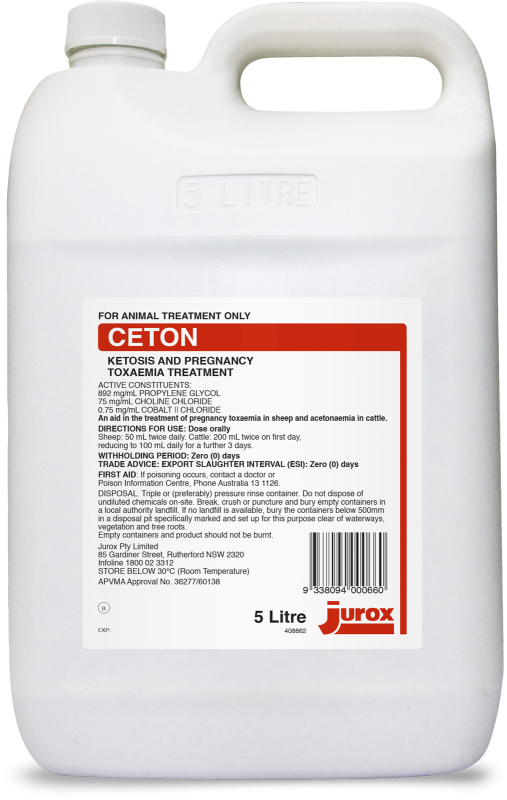 An aid in the treatment of pregnancy toxaemia in sheep, and acetonaemia in cattle. 50 mL twice daily 200 mL twice on the first day, reducing to 100mL daily for a further 3 days.